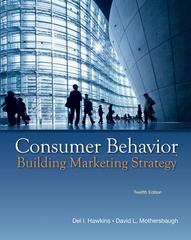 Consumer Behavior: Building Marketing Strategy 12 Edition Consumer Behavior: Building Marketing Strategy provides students with a usable, strategic understanding of consumer behavior. The authors believe that knowledge of the factors that influence consumer behavior can, with practice, be used to develop sound marketing strategy. As a consequence, the text integrates theory, strategy-based examples, and application.